Science Fit Personal Training - Get Fit Fast! Too busy to exercise? think again! train only once or twice a week! 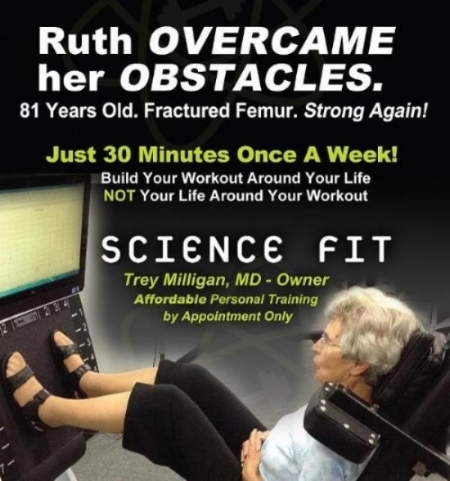 Science Fit founder Dr. Milligan discusses training with Emily. "I don't have time to exercise!" As a physician, Dr. Trey Milligan heard that concern over and over from patients when he encouraged them to exercise. They understood the benefits of exercise including enhanced muscle mass, stronger bones, increased energy and work productivity, improved mood, clarity of thinking, lower blood pressure yet they still found it difficult to fit an exercise regimen into their already busy lives. 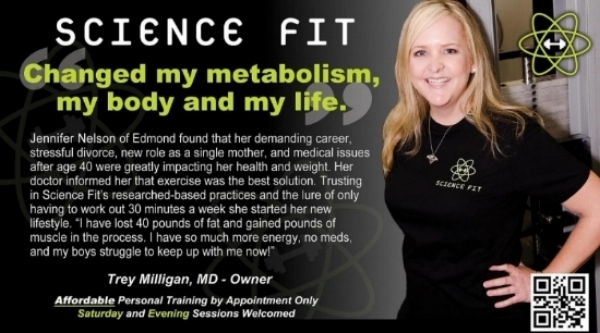 In 2011, Dr. Milligan left traditional medical practice and opened Science Fit personal training studio to address the concern, "I don't have time to exercise." Science Fit provides a researched backed, efficient, effective safe workout that delivers all the benefits of exercise but requires only one or two 30 minute sessions performed each week. 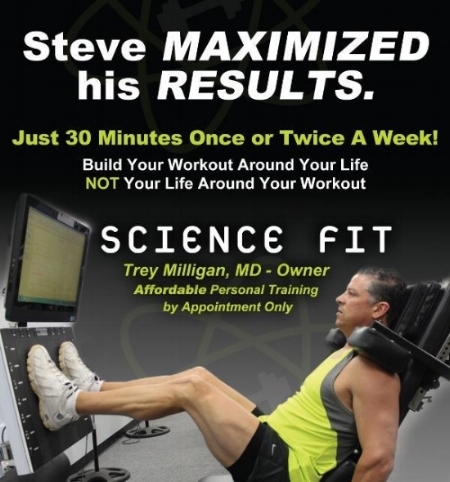 Science Fit training requires just one or two 30 minute sessions weekly. Train once weekly for good results. Train twice weekly for even better results. The climate controlled environment prevents sweating and some choose to train in street clothes saving them even more time. Science Fit provides low impact yet high intensity training routines customized for the age and ability of each individual. Our actual client age range is teen to 85 years old. Safety is built into the training protocol and is enhanced by using quality equipment brands such as Medx, RenEx and Nautilus. Every Science Fit training session is directly supervised by a Science Fit approved trainer who is there to guide, encourage and instruct. This provides both expertise and safety for our clients. Every Science Fit session is conducted one-on-one with a Science Fit approved trainer and is performed in a completely private setting. Only one trainee at a time is allowed in the training area. CALL 405-748-0028 TO SCHEDULE YOUR INITIAL CONSULT!